167 pages. This is the story of Edwin Drinker Cope and Othniel Charles Marsh, two scientists who found and fought for dinosaur bones, and the artist Charles R. Knight who almost single-handedly brought dinosaurs back to life for an awestruck public. Bone Sharps features plenty of special appearances by the Cardiff Giant, P.T. 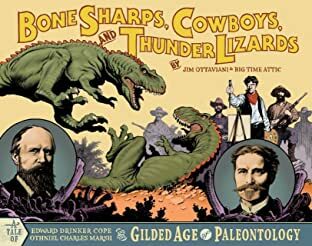 Barnum, Buffalo Bill Cody, Ulysses S. Grant, Alexander Graham Bell, and a plentiful supporting cast of rogues & gallants from the eastern scientific establishment and the old west.